Technically speaking, there is one and only one word that rhymes with orange. This is bad news for poets who want to write about their oranges, unless they plan to engage in other forms of word play. Is your child up for this writing challenge? 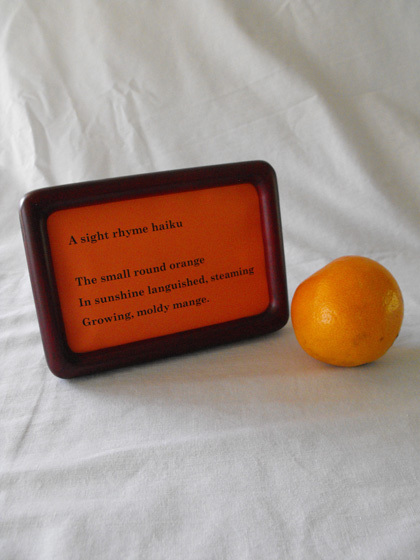 Explain that you are going to play a word game and write a silly poem about the orange. Believe it or not, there is only one word that rhymes with orange. Sporange is a botanical term for part of a fern. Fortunately, poets don’t have to write only with rhyme. They can play with words in other ways. Alliteration is when words with the same first consonant are used consecutively. All the words in “tiny turkey toes” begin with T. Unfortunately, orange begins with a vowel. 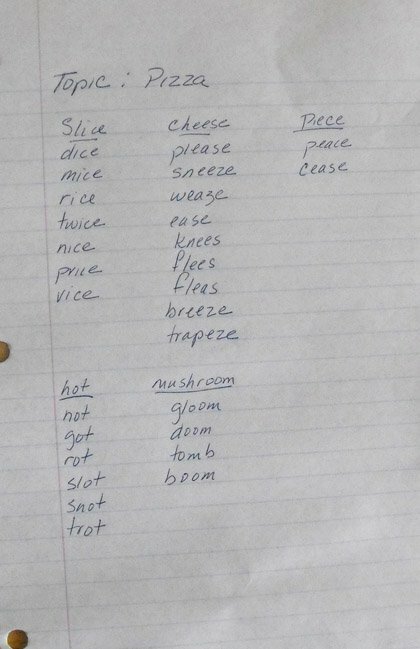 Another kind of alliteration calls for repeating the same vowel sound anywhere in the words. This means you could use the phrase “orange porridge requires special storage.” Or, your child could come up with an even better phrase of his own. Assonance is similar to vowel alliteration, but the words with the same vowel have to occur in a row. What can you do with orange assonance? What about “rinse with orange tint”? Help your child brainstorm several ideas and write them down. Another form of word play is the sight rhyme. In a sight rhyme, the words look like they would rhyme, because they are spelled the same, but they are pronounced differently. For orange, you could use arrange, exchange, change, derange, mange, or strange. What sight rhymes can your child think of? Take what you have brainstormed and use it to write an orange poem. It will probably take more than one try before your child has a poem he's willing to share, but rewriting is a skill all good poets develop. Help students learn how to recognise the beats in a poem with this worksheet. Practise rhythm and rhyme with these step-by-step instructions for a pantoum poem! Have some fun with haiku! These haiku poem prompts mix pop culture with zen creativity. Write the story to go along with this series of story illustrations with this fun writing prompt. Get acquainted with a few different writing techniques with this fun prompt. Kids will start the same story in a few different ways. Kids practise argument writing with this claims worksheet. 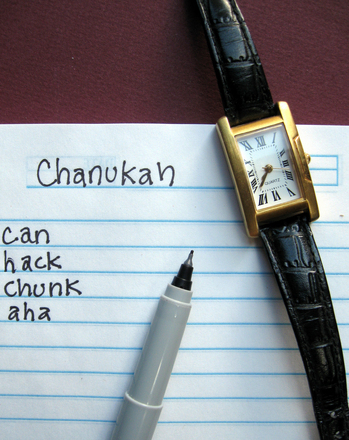 Your fourth grader will get his mind working with this simple "Chanukah" anagram game. He will hone her language and spelling skills with this one! 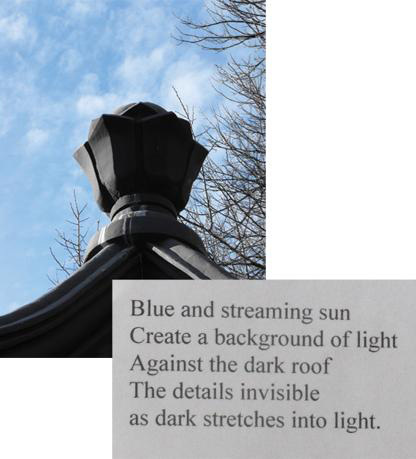 Most of us are familiar with haiku, but the tanka is an even older form of Japanese poetry. 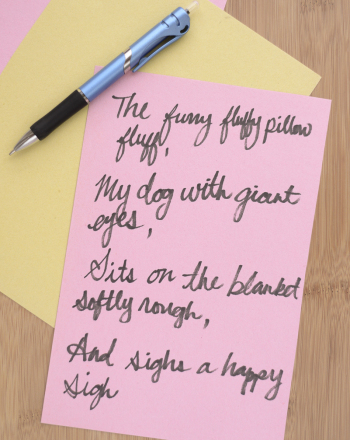 Learn to write a tanka poem with this activity.